Along Atlanta’s potholed Howell Mill road, sagging sheds of metal salvagers, brake liners, and security-gate fabricators are rapidly giving way to Texas donuts: faux-loft apartment buildings wrapping parking structures. Amid the light-industrial detritus can be found a contemporary-art incubator and the White Provisions development, a huge residential/commercial loft complex that anchors a wildly popular restaurant and retail scene. It’s a real-estate wild west, as Atlanta tries on the idea of becoming a city. I visited Atlanta late last winter for a book I’m writing, Stories Cities Tell about the Future. I have chosen a few cities to write about that seem to have arrived at something of a crossroads. That, I learned, is certainly the case with Atlanta. 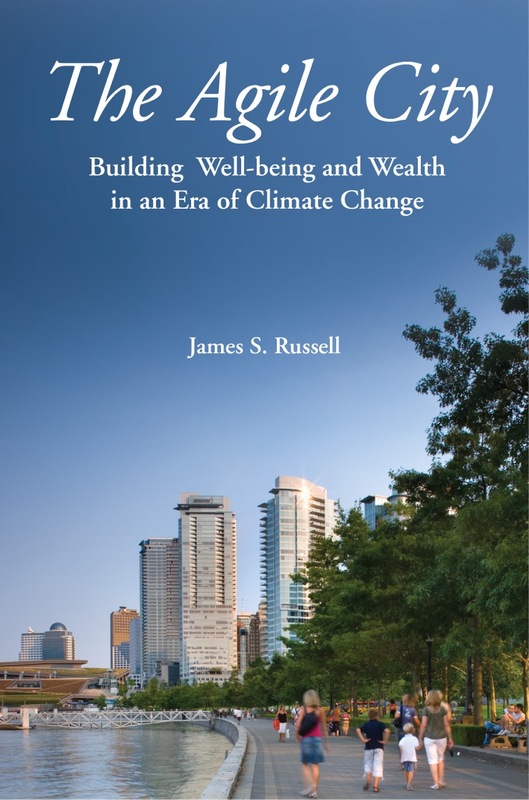 The city grew extraordinarily rapidly for decades on freeways and subdivisions tucked under the lush canopy of trees, but in recent years growth has slowed. The recession hit hard. 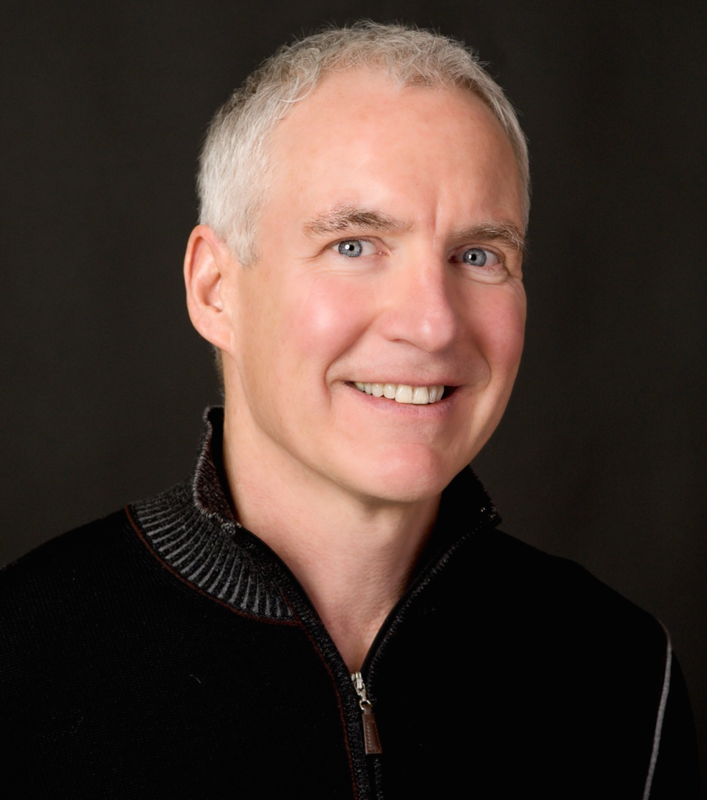 In May, the city hosts the American institute of Architects’ National Convention. Participants may wonder where the “city” of Atlanta is—as people long have. There’s no great urban gathering place (the fussy, tired Olympic Centennial Park hosts no local life but simply foregrounds such architecturally inept attractions intended to distract conventioneers as the World of Coca Cola and the Georgia Aquarium. I had hoped to see the Center for Civil and Human Rights, a promising museum that recently opened, designed by Raleigh architect Phil Freelon, but it was closed the day I visited by panic over a snowstorm that failed to develop. As young adults, many of the ubiquitous Millennials reject standard suburbia, with its mortgage obligations and long commutes, instead embracing Atlanta’s few charming neighborhoods of bungalows and cottages. The ones east of the downtown core burst with new energy as people seek places that feel real, where people meet, socialize and have fun. 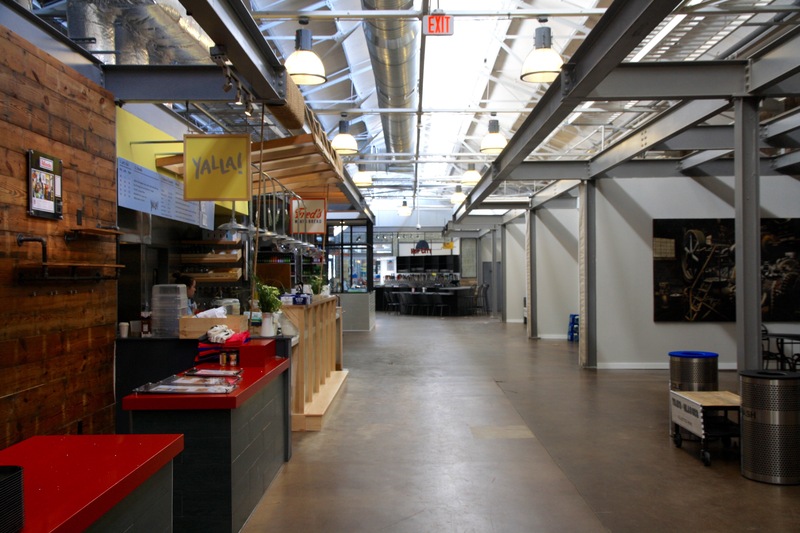 The Krog Street Market, in the Inman Park neighborhood, had only opened a few weeks before I arrived, yet it swarmed with people (I snapped this photo in a rare mid-morning lull.). It’s a food hall bursting with high-style eateries that dote on meat from hand-raised livestock, artisanal fast food, and craft brews. 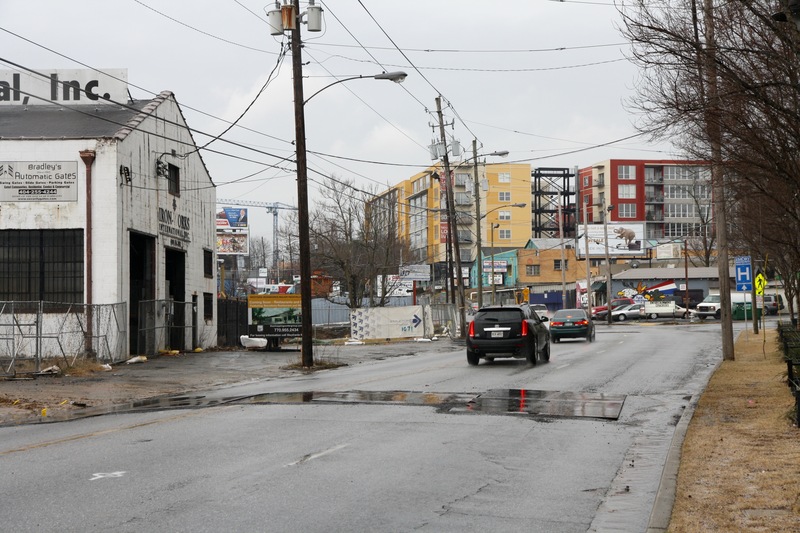 The surrounding land, until recently industrial, now sees rapid development of wood-framed faux lofts just like the ones along Howell Mill Road. Real-estate developers have gone whole hog for urban lifestyles, but this stamped-out product is extraordinarily flimsy and dumbed-down, free of architectural insight or amenity. They make lousy neighbors. Much of the new wave of urban-apartment building has gone on in neighborhoods that already have traditional urban infrastructure, like sidewalks, which are remarkably rare in metro Atlanta. There are sidewalk fragments along Howell Mill Road, but you wouldn’t call it walkable. The area itself is isolated from the rest of the city, as so many neighborhoods are, by highway and other infrastructure corridors. The hunger for urbanity mystifies a massive local development community that has lived off the ever-expanding suburbs, the ever-widening freeways, and the proliferating office parks. But these places are no longer expanding, widening, and proliferating as the enclave lifestyle comes to seem too suffocating, the traffic too frustrating, and the office parks ill-suited to contemporary work cultures. A gigantic 1920s brick loft building that once was a rather dignified store and warehouse for Sears is being transformed by the developer Jamestown into—inevitably—loft apartments above what’s called Ponce City Market, another food hall. 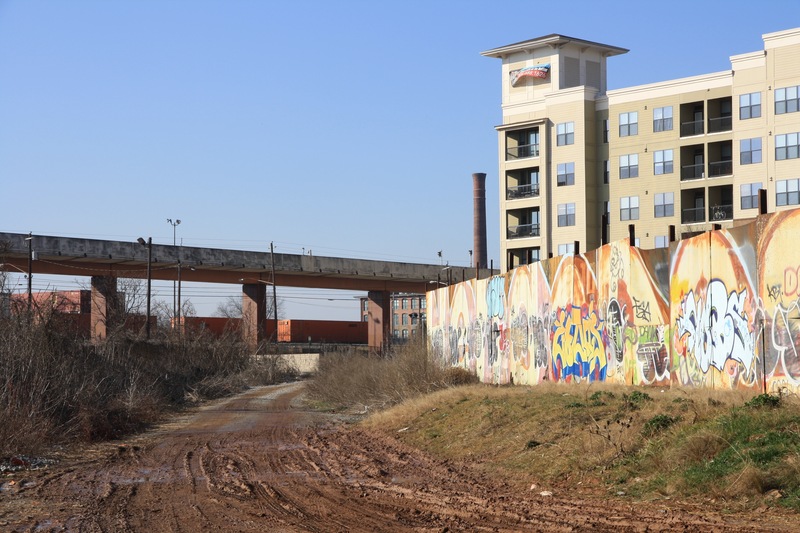 Both Krog Street and Ponce City abut the most fully realized segment of the BeltLine, a 22-mile park, trail, and planned rail-transit corridor that necklaces central Atlanta. It may someday unite 46 neighborhoods and in that way could be truly transformative. The 2.5-mile East Side segment swarms with cyclists, dog-walkers, and perambulating parents, demonstrating a hunger for places where you can promenade in the city. Panoramic views open unexpectedly; restaurants and bars are springing up like crazy. 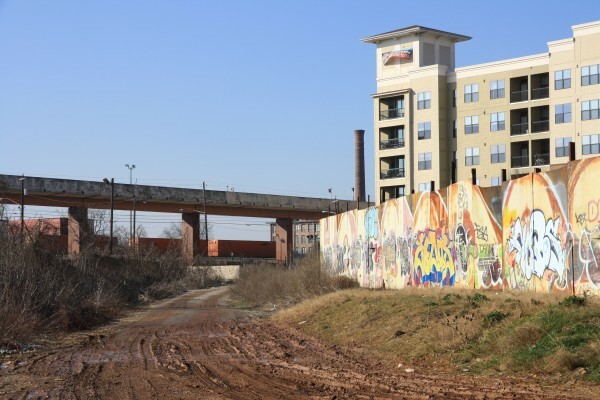 The BeltLine has come to fruition slowly and so far feels a bit clumsily over-engineered yet under-designed (masterplan by Perkins + Will with James Corner Field Operations), which reflects the widespread disrespect for the possibilities of architecture in Atlanta. Other segments are open, but amenities of those in poorer communities tend to be skimpy so far. The timidity in approach also reflects the Southern reluctance to spend money on anything public—even though the real-estate frenzy generated by the Belt Line has already demonstrated how powerfully catalytic it can be. Why someone would shop for an exquisitely detailed dress in a building where the fake-stone panels don’t even align is beyond me. Like many real-estate names, this one is redundant, but the project had formerly been known as the Streets of Buckhead. In trying to parse the name change, I wondered if the idea of streets was simply too exotic or (more likely) deemed too downscale. Buckhead Atlanta wraps and tries to ignore the Buckhead public library, a tiny but pugnacious low-budget steel grey box that nevertheless extends an idiosyncratic welcome with an elaborately composed steel canopy. It’s a refreshingly inventive 1989 design by Atlanta’s world-class architects, Merrill Elam and Mac Scogin. Because it is a public building, though, it has been allowed to deteriorate alarmingly. This just scratches the surface of Atlanta’s complicated present and future. My travel to Atlanta and other cities was made possible in part by a grant from the Graham Foundation, for which I am grateful. I’ll be writing more and look forward to returning to a city of fascinating and articulate voices. Couldn’t agree more. You have more insight about Atlanta than many here. While your analysis is dead on, I think your tone is maybe a little too scathing / snarky for its own good. If I were an Atlantan (fortunately not) I would read it as written by just another good for nothin’ Yankee without wanting to get into the substance of it. It was mainly Atlantans who guided me to these places, FYI. You made Atlanta seen culture less and plastic. All Sunbelt cities are not the same age. The Metropolitans of Atlanta, Dallas, and Houston were already a million people before the sprawling Sunbelt boom. Atlanta was founded as a rail town, the first to reach down in the south, by the civil war while still a small town it was the second most important industrial center of the south. After the civil war 1870’s the term the “new south” was coin by Atlanta leaders to represented southern cities base on industry which contrast the agrarian culture. Atlanta and Birmingham became southern gilded age cities. Smaller version of Cleveland, Kansas City, and Pittsburgh. By the 60’s American culture change and heavy industry started to decline. The Sunbelt started to boom. New major cities like Nashville, Charlotte, Orlando, Jacksonville, Raleigh Started into come in the picture. Most of Atlanta core is historic neighborhoods build 1870’s – 1930’s……. many of which are on the national historic landmark and places, and that have own distinct identity and personality from each other. 1. Sweet Auburn 2. Cabbagetown, 3. Castleberry Hill, 5. Virginia-Highland, 6. West End, 7. Grant Park, 8. Inman Park. Historic midtown district and commercial areas like little 5 points, East Atlanta village and etc. Many of which where historic street car neighborhoods. Their overtly different architecture style between them. The Historic Craftsman dominated Virginia-Highland, is very distinct from the Victorian dominated Grant Park, which is distant from the Shutguns of Cabbagetown. and etc. and etc. The reason a lot of redevelopment is industrial Especially on the West side. is reflection of the city history. Even the belt line project is a redevelopment of a historic rail road that loop the city meant as a by pass. Most infills in cities across the country are just loft develops. It’s clever the city is echoing the industrial past. Both architecturally and the cityscape. I think it’s important to understand Atlanta history is why many misunderstand the city. because a Sunbelt is assume to have little or no culture. I brought this up because Atlanta and Kansas City had similar historic density and population. Before Atlanta boom into a modern Sunbelt city. So what I learn is people assuming Atlanta is younger than it is, and don’t know the historical context to the city, architecture and neighborhoods at all. I&817#2;ve lost some weight recently and I’m now kind of between sizes. I had to buy some clothes the other day and I thought I was going to freak out. I either need to gain a couple pounds, or lose a couple, or else I’ll go insane. I visited Atlanta several decades ago. It reminded me of Los Angeles in the good old days. There was no center. For a long time the only thing L.A. had to demark its center was the city hall building that stood in for the Daily Planet Building in the Superman TV show of the ’50s. Atlanta struck me the same way. There were a couple of skyscraper buildings (the Peachtree Hotel, I can’t remember what else) and that was it. Everything else was flat. This was just after an effort to revitalize downtown. The buildings were supposed to spark urban development. They were not that old when I was there but it was already obvious that the spark hadn’t caught fire. Paris is flat, or it used to be until recently. But there is a definite character to the place. Atlanta had lost whatever southern charm it might have had from days past and was just generic. I wish them well and actually think they have a chance to pull it off this time. And if not now then soon. I think the cultural and economic compass has swung and now favors urbanization. You can read some of that kind of vibe in Jim’s description of what he found recently. That gives Atlanta something to build on. And that gives them a fighting chance. It often takes a couple of tries for something like this to actually catch on. So I think that even if the current effort fails it will contribute to a foundation that might end up being sturdy enough to support success the next time. Atlanta is on the Piedmont half the region suburban counties are apart of Appalachia. It’s one of hilliest metros in the country. The core is flat because Atlanta was founded as a terminus for the railroad, the area was specifically pick so trains can turn around. Atlanta has 3 CBD’s. Downtown is only part of Atlanta center Midtown receives more development and attention. Despite everything, Texas donut lofts is a great name for a breakfast food. You should visit the dead pseud-city of Jackson, Miss., and my nearby hometown of Canton, then compare it to the affluent suburbs spreading out and away from the mostly black cores that remain. Some very distressing social and economic dynamics are at play there, of course with deep historical roots. The shopping malls could be in Southern California. The city and the historic town, which could be scenes for urban rebirth, are dying. Even in Canton, the 19th century buildings surrounding the beautiful historic square could become extraordinary loft-like living spaces, but there’s no vision and no money, certainly not public money, to make such changes. Love the energy–and the many people I met who care. But bottom-tier private development and low-aspiration public development does not do any favors to the aspirations of those who want Atlanta to do great things. Thanks for commenting. 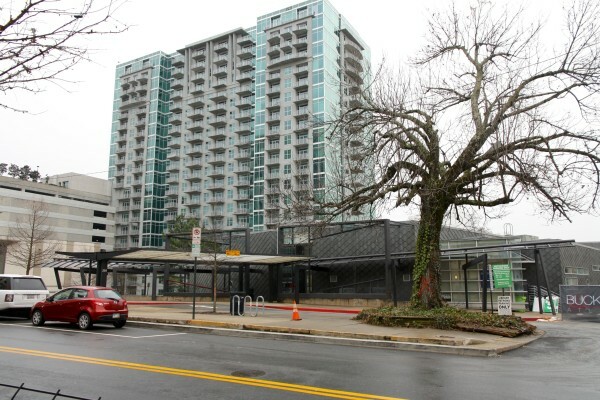 A couple notes on your comments regarding “Buckhead Atlanta:” There is a significant backstory to how the development came into being, a process that began in 1999. The original developer lost the project during the recession, stalling (about 25% complete) construction for two years. A new developer took over, and had the complex task of inserting an entirely different program over 8 acres of in-place structure. 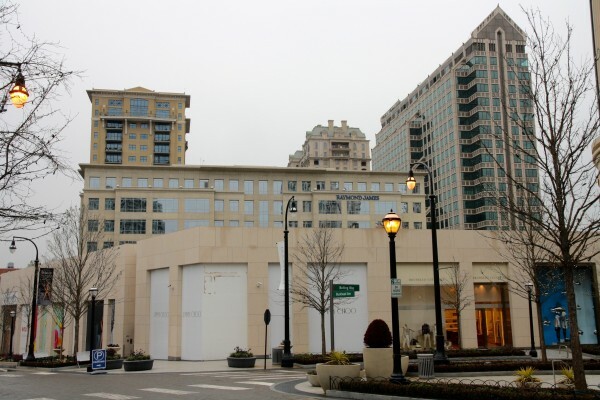 The original name, “The Streets of Buckhead” was thought to sound too “mall-like,” and did not jibe with the goal of making a series of streets (and they are public streets) that are rewoven into the local grid. Eventually the “name” will go away and it will just be a part of the city. Additionally, the library has not been ignored. There has been a concerted effort (although not yet realized) to integrate the library into the streetscape, a challenge given the library’s entry sequence was conceived when the site was much more suburban in nature than it is now. Finally, the building in your photo with the “fake” stone is faced with (real) Portuguese limestone in a rainscreen application. The (deliberately) non-aligned pattern was conceived to reinforce the building’s parti, in which vertical piers are placed randomly to better anticipate tenant demising-wall locations. Each piece of stone was hand cut to ensure perfect tolerance, and exact 1/4″ gaps….a level of craftsmanship and attention to detail not unlike the couture fashion sold within. It’s biting criticism but also eye-opening. You caught Atlanta at a critical juncture as it rebounds from really tough times. There’s more awareness now of how things should be done better. It’s surprising that our local consumers of urbanity are more sophisticated than the development machine that provides living and working spaces. When a real quality piece of design arrives, we can’t get enough of it and can’t stop talking about it. But, somehow, the design agenda doesn’t catch on with the producers and the same tired products appear again and again. The amount of money required to “fix” our suburbanized infrastructure is so great that there’s little likelihood of, say, spanning the expressway to reknit neighborhoods, or bridging the railroad yards to link downtown with the historically black universities to the west. Even worse, huge new structures — Falcons stadium and World Congress Center — form a chinese wall separating these neighbors. That is going to last a long time. So, we’re left with occasional large projects sponsored by governments or Community Improvement Districts that create little urban oases at historically important nodes, or little bits of opportunistic urbanism here and there, like the White Provisions project you saw. Over time, these might become small urban ecosystems that may or may not eventually link up. But the expressways and railroads will always split the communities apart until it becomes important enough to pay for reestablishing linkages that span these barriers. And the dozens of quarrelling, balkanized local governments can’t get together to collaborate on bigger idea of how the city ought to develop. They don’t even like to admit that they are part of the city. So we’re condemned to small, organic, disorganized growth in a hundred diffuse places, only connected where required or essential. It should be a very interesting book. As an Atlanta who recognizes and shudders at our many issues, the likes of which are only barely touched on here, I’d also welcome anyone to come visit and take a tour with me and have a different perspective of some of the same places. What’s lost in this write-up is that the neigborhoods around Krog Street Market, the Beltline, etc are fantastic, full of single family homes, mostly good school districts, yet only 1-2 miles from Downtown and Midtown, 2 of the primary job centers. Buckhead is 4-7 miles north, a very short drive by Atlanta standards, where many more jobs are. Virginia-Highland, Midtown, Piedmont Park, Druid Hills, Downtown Decatur, Peachtree Hills, Collier Hills, Ansley Park ….Atlanta is entirely about its neighborhoods that are authentic and proximate. 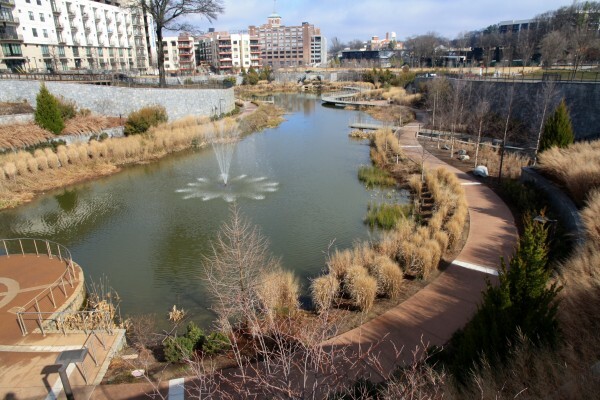 The ability to live in the city in quiet, single family (1900-1950s built) neighborhoods mixed with some old and new apts so close to the city center, the jobs, the entertainment, etc is the best part of Atlanta for me. Atlanta is a great place to live and a difficult place to visit without the right guide. Miami, where I lived for 20 years, is a great place to visit, not a great place to live. Thanks so much for visiting us in Atlanta. It’s great to have a fresh set of eyes on the place. Though we do get our dander up about outsider criticism: We know, we know, we know. And we are very hard on ourselves and our neighbors – were are very self-snarky. But it’s pretty good living down here and we have many folks trying to do things a little better when we get the chance. HT to Peter Drey telling me about your blog post. I think Atlanta’s shortcomings as a city are closely related to the fact that for decades now people have been saying (bragging) that they live in Atlanta when really they live in some housing subdivision 20 or 30 miles removed from the city and were happy to drive to the closest Walmart and Chick-Filet as long as everyone they knew knew they lived in Atlanta.